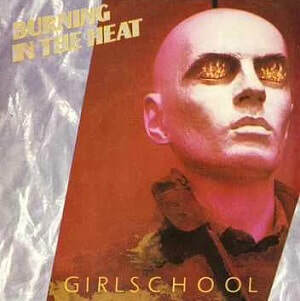 Burning in the Heat is a single from the British heavy metal band Girlschool, released by Bronze in January 1984. A cover of the 1977 Slade song, "Burning in the Heat" was written by Noddy Holder and Jim Lea, with Girlschool's version produced by Lea and Holder. It was released as the second single from their fourth studio album Play Dirty. In early 1983, Slade's newly-recorded The Amazing Kamikaze Syndrome album was met with a mixed response from their label RCA, who felt the album lacked potential chart hits. While work on the album had continued during the early part of 1983, Slade would see little activity until later in the year. Meanwhile, Lea and Holder were approached about producing Girlschool, who wanted the pair to produce their next single. They agreed and recording began in June 1983. The rest of the band's new album was due to be recorded in Los Angeles with Quiet Riot producer Spencer Proffer. However, Girlschool were pleased with the results of the sessions with Holder and Lea, and asked them to produce the album in its entirety. Recording of Play Dirty was completed in August and marked a change in the band's appearance and musical style as they attempted to make a commercial breakthrough in America. In October 1983, both Play Dirty and its first single, "20th Century Boy", was released. While the single failed to chart, Play Dirty reached No. 66 in the UK, which was considered a commercial disappointment, while a lukewarm reception was received by fans and critics. "Burning in the Heat" followed in January 1984 as the album's second single, but it was also a commercial failure. Speaking to Sounds in late 1983, Holder recalled: "Their manager approached me and Jim in the first place and asked us if we'd produce a couple of tracks with the girls for their next single. So we did that and they liked the results so we did the whole album." Speaking of working with the band, he said: "It was really hard work; they're terrors! They're just like the Bash Street Kids really. Discipline went to the wall, but the end product was good and that's all that matters." Lea told Record Mirror: "It was fun working with Girlschool although they were pretty lively and a real handful. We've made them sound more melodic than they've ever done before." "Burning in the Heat" was released on 7" vinyl by Bronze Records in the UK and Australia. The B-side, "Surrender", was included as an album track on Play Dirty. The 12" vinyl version of the single, released in the UK only, featured the same tracks. A limited edition version of the 12" release included a colour brochure. Limahl of Smash Hits said: "Produced by two of the guys from Slade, this little ditty seems terribly American. Are they American? I'm sorry, I don't like this at all. I've heard this sort of thing a million times before. In fact, I'm sure I've that melody somewhere before too." In an unfavourable review of Play Dirty, Josephine Hocking of Smash Hits said: "Songs like "Burning in the Heat" and the title track prove beyond any reasonable doubt that sexist lyrics and boring guitar solos can be done equally badly by women as by men."